Just like this cute little BDO baby, we all have to start somewhere. Playing Black Desert Online for the first time can sometimes be overwhelming for newbies. There is so much to learn, but also so many new sights and adventures to discover! My sissy and I have created this Beginners Guide to help those just starting BDO, and for MMORPG fans considering a purchase of Black Desert Online. Here you will find beginner tips we wish we knew before starting Black Desert Online together. I hope they help you along the way. Choosing the right class for you is a very personal decision. Do you like complexity or simple? Speed or slow and heavy hitting? What's important to someone else, you may not even think about. Ultimately, you will end up playing the class you enjoy the most, no matter what this guide tells you. Is Witch/Wizard Class right for me? High & Cheap Sustainability: Beginners have to worry less about using up precious inventory and weight limits on buying and carrying Mana and HP potions. (Pots are very heavy.) They are more free to focus on obtaining loot and using silver for gear. They have several spells that almost instantly regenerate health and mana. Magic Lighthouse: a spell that turns a monster's attention away from you and reduces their defense. This can help beginners, who probably have lower gear scores and need to save money on repair bills and pots. Another bonus for beginners who choose this class, is that it has a good reputation for being strong in both PVE and large scale PVP. Some people hate this class because they say it's boring, and others love it. I suggest you play a class that looks fun to you at least until level 56. At level 56, all classes change by getting a new set of combat skills after their Awakening. If you don't want to go through the leveling process to 56, you can test out a level 60 of that class with a Trial Character. Read more about this below. For more info on available classes, with an overview of their rankings, strengths, and weaknesses, visit BDO Class and Character Creation Guide. Trial Characters were recently added in the 6th March 2019 Patch. This allows you to try out a class to see if you will like it near end game. Trial Characters can only enter a PVE cooperative tower defence mode called Savage Rift or specific PVP areas: Battle Arena, Red Battlefield, Arena of Arsha. No Savage Rift rewards. Trial Character Limitations: Can't impact Family Fame. Can't do normal activities like Attendance Rewards, In-game Mail, Challenges (Y), Node investment, and Guild Bonuses. Click <Here> to find out more about Trial Characters. All the characters that you create on your account will have the same Family name. This Family name will be visible text above your head to players who run into you. It will also be visible in chat. No matter how many different characters you make, you will always have this name. In BDO, you can't role play and experiment with having different characters in different guilds. Each character is tied to the Family name, which you can't hide. (Unless you purchase and put on a Pearl Shop outfit called Desert Camouflage.) When you join a guild, all your alts join as well. Players can switch between viewing Family or Character names in chat, by clicking the gear icon on the chat tab. This only shows/hides names in your User Interface. Other players will still be able to see your names, title, and guild if they have this setting turned on. Attendance Rewards are game items you obtain every day just for logging into the game. View them through the Escape Menu. The most recent "Rookie" Attendance Rewards for new players looks good! Value Packs to last one month. Sometimes Guild and other special event Attendance Reward tabs open up. Returning players (who have not logged into their account for 30 days) also get a special tab. Notice that Attendance Rewards are only available for a limited time. "Loyal Attendance Rewards" normally only have a short monthly window. "Guild", "Rookie", and "Returning" player tabs usually have a broader time frame to collect. There is an icon which is displayed for new and returning players. When you bring the mouse cursor over the icon, the time left for Olvia servers is displayed. The icon is located where the Value Pack icon appears. Soon after you enter the world, the default UI will alert you to many different things that occur in the game. These include Trade notifications and other things like when other players fail or succeed at enhancements. Esc > Community > Chat Filters. BDO has its share of people advertising this or that. You can limit what you see in chat by filtering out whatever terms you like. Filtered words can be up to 50 characters long. The chat filter is literal, not case sensitive and does not support wildcards. Any chat containing the filtered word will be completely removed. The following gets rid of many gold sellers as well as people spamming chat with memes, annoyances, etc. Thanks to bdoparadise.blogspot.com for sharing this chat filter example! To purchase Pearl Shop (F3) items, you must first buy Kakao Cash via the official Black Desert Online website. Use the Kakao Cash to buy a box of Pearls at the Pearl Shop in game. The Pearl box will go into your Pearl Inventory. Access the Pearl Inventory by clicking on the Pearl button at the top of your main Inventory window (I). Right click the box to collect your Pearls. Now you can buy items from Pearl Shop with Pearls. A limited number of Pearl outfits, pets, and horse gear can be sold at the Marketplace. Always double check that the Pearl item has a Marketplace Value if you plan on purchasing Pearl items to sell on the Marketplace. You could gift Pearl Boxes and Pearl items to friends for a limited time, during Christmas. It's uncertain if this will become available again, if ever. This game takes serious effort into quelling the actions of gold/account/power leveling sellers, but their ads are still visible in game. You can easily filter out terms in chat to block them. For those who want to use Gifting with Guild members, both the giver and receiver must have been in the guild for at least 5 days. Gifting will be allowed for characters of level 55 and above. Gifting via searching Character Name will not be available. The main game currency is silver, and it can't be given to another player. Player to player trade is very limited in Black Desert Online. Most things like gear and accessories cannot be traded to another player and must be sold at the Central Market. Some exceptions are Health and Mana Potions and some foods and drinks. Also, once those items are traded, they become bound and can't be re-traded or sold. Energy is another type of currency in the game and has many uses, such as allowing you to use Life Skills like Gathering and Farming. Maximum Energy is increased when any character you play completes Knowledge topics. Your Energy and Knowledge gained is shared across all your characters (Family). The easiest Knowledge topic to complete is the Character type, in which you have to talk to the NPC to gain their Knowledge. Talk to every NPC with a question mark on your mini map to discover them and gain Knowledge. Press the H key to see a breakdown of all the Knowledge to be gained. For a more detailed guide on Energy, please read our Energy Guide. There is also a Knowledge Guide and a Knowledge Locator to help you find the nearest Knowledge to your location. Energy can be actively restored through quest rewards. Energy can also be increased with potions and buffs; most notable is Blessing of Kamasylve, which increases Energy regeneration by 2. It costs 1000 Loyalties (10 days of logging in for one hour) or 1,250 Pearls. ($12.50). Small energy tonics cost 100 Loyalties. Contribution has 2 main uses in BDO. Most people spend their Contribution on purchasing Nodes and building their "Worker Empire". It takes Contribution Points to buy lodging for workers. Any kind of workshop housing will cost you CP as well. Renting weapons, armor, and storage space is another option for spending Contribution, for players that don't like crafting or world building. Right clicking anywhere on the World Map (M) or the mini-map will draw a path to that point. Right clicking a node icon will take you to the Node Manager. Press your T key to have the game auto-run a path for you. Auto-path will follow the safety of roads as much as possible. Be careful when doing this outside of roadways, as your character can get stuck on trees and other objects. Not all roads are safe and sometimes auto-path takes overly long routes, so be watchful auto-pathing in areas you're unfamiliar with. To find merchants and other NPCs, click on the NPC icon in the upper right of your screen. Mounts are now easier to obtain for Beginners. There are usually quests or Attendance Rewards for them. If, however, you find yourself too long without one, visit the <Stable Keeper>, where you can purchase a Horse from Lorenzo Murray in Velia. Horse Emblem: Beginner's Horse is available in his shop for 15k, but he also gives you access to a player Horse Market. You can find much better horses at the Horse Market. <Stable Keepers> with a shop and Horse Market are available in most major cities. You will notice that Horse Market prices for low level horses of up to Tier 4 are fairly cheap. Perfect for beginners. Tier 5 is a bit expensive, but maybe you will get lucky with some overnight AFK fishing. :) Keep checking if you don't see anything at first. While you are at the <Stable Keeper>, you may want to purchase food for your horse (carrots) and pets (Cheap Feed). Horse Stamina and Health can be recovered for less expense by any <Stable Keeper>. If you lose your mount or forget where you left him (poor guy), you can locate him by right clicking on your horse icon in the upper left of your screen. A path will be drawn to your horse. Left clicking on the horse icon will call your mount to you, but if he is too far away, it won't work. You can also retrieve your mount by remote collection at the <Stable Keeper> if he is not stabled in another city. If you left him at Toscani Farm, but you are near Heidel, go to the Heidel Stable Keeper and choose "Remote Collection". If you do this, your horse will lose its health and you will have to pay silver or give him carrots to recover him. ALERT! Don't learn the hard way and drown your horse like I did! :) Your mount does take damage! He will loose health from monsters hitting him and from drowning and falling off high places. If your mount dies, recover him at the <Stable Keeper>. You can only have one mount/wagon out of the Stable for each character. For a more detailed guide about getting around BDO, pease visit the guide, Fast Travel. You can have up to 5 pets out at the same time. Pets are bought at the Pearl Shop or given as Attendance/Challenge Rewards. Pets pick up your loot for you. Pets have a max of 4 tiers and each tier has up to 10 levels. The higher your pet's level and/or tier, the faster it will loot. Pets gain higher Tiers after they are Exchanged. They are given 1 Special Ability, 1 Talent, and up to 3 Skills. Pets level up after being fed. To level your pets faster, switch them to Agile mode so your pet's hunger gauge decreases faster. If your pet's hunger level reaches 0%, it will no longer loot or use its special ability. It's skills, however, will still work. Pet Exchange or "Pet Breeding" is used to produce a higher Tier pet, which is faster and is able to acquire more skills. Unfortunately, exchanging pets actually kills the parent pets. On the bright side, it has been reported by several players that T4 pets have 3 to 4 times faster loot speed than a Tier 1 pet. Bddatabase shows loot speeds that are about 2 times as fast. Cheap Feed can be bought at the <Stable Keeper> for 3,000 silver and restores 12 hunger. Better pet food can be cooked or bought at the Marketplace. This Pet Talent and Special Ability table is just a small list of available pets. To view all of them please visit our BDO Pet Guide. Pet Talents and Special Abilities for T1 pets like dogs and birds are good for grinding. Other pets, like cats and Hedgehog, are good for Life Skills. Pandas currently have a strange mechanic, so you may want to avoid them, unless you think they are too adorable to pass up! (Which they are.) Their aggravate ability only works on one mob every 10 to 4 seconds and it has been reported that this animation takes priority over the pet's animation to pick up loot. (You can turn Special Abilities off.) If this has been fixed, please let me know! Many players say the Hedgehog is the best pet in BDO. With my own testing, I discovered I gathered 3x less than my sister who had a Hedgehog. This makes a big difference in the amount of time it will take to gather logs for ship building, for example. But Hedgehogs aren't good for players who don't gather and craft. Both the Hedgehog and the Polar Bear have limited availability. You can obtain these pets after purchasing a Gift Package for yourself or a friend and having that account level to 30. Gifting yourself another account might sound strange, but it has been OK'd by a GM on the official forum. According to their game gifting buy page: "The only restriction will be that you will need to own the game yourself and have purchased it before the first of this month." This means, as a new player, you would have to probably wait until next month to gift someone in order to obtain the Hedgehog or Polar Bear. Currently, you can buy the BDO Gift Package here for $9.99. There are a few other ways to obtain these limited pets. To learn more about how, please visit our Hedgehog Guide. For more detailed information about pets, their buffs, and how to breed, manage, and obtain them, please visit our BDO Pet Guide. Is BDO Free to Play? There is no subscription fee for playing Black Desert Online. Many people consider this model free to play. It also has a 7 day free trial. However, you do have to initially make a purchase of at least $10 to continue playing BDO. This will give you the basic game without any extras. Some also consider the Value Pack a type of subscription fee. It lasts 30 days and gives 30% back after a 35% tax on Marketplace sales. It also gives good buffs to weight, inventory, and experience. This is a hotly debated topic, because everyone has their own definition of what Pay to Win means. But most people agree that you do have to spend more than $10 to make the game enjoyable. Even with the maximum of 5 pets, you may have to wait for pets to pick up loot, depending upon how fast you can kill monsters and what Tier and Level your pets are. In order to raise a pet's Tier, you have to buy another pet and combine two pets into one, so that doubles the price. Note: BDO has been giving players a free pet Kuku bird and Penguin through Attendance Rewards. Beginners to BDO will get the "Rookie" Attendance Reward. At the moment of this writing, that included one free Kuku pet that is Level 1 and Tier 1. But we don't know when or if they will give away pets for free again. Penguins are more rare. You will notice that two of the same Event pet can't be used at the same time if they are the same kind. (For example, you can't have two Kuku pets out at the same time.) You can, however, Exchange 2 Kuku pets to create a higher Tier Kuku. If you enjoy questing, be sure to select All quests at level 20, so you won't miss out on any extra quests and rewards. Certain types of quests, like Life Skill quests, will not even show up at the NPC if it is not turned on in your Quest window. Press the O key to open the Quest window. Quests are important for beginners to BDO, especially the main story quest that is provided by the Black Spirit. It will give you a nice chest piece, Inventory expansions, and other goodies helpful to Beginners. The main story will lead to this upgraded version of Dim Magical Armor. Dim Magical Armor is upgraded 4 times via quests from the Black Spirit. The first of which is called, Magic Armor Exchange I and is given at level 53. There are also Roaring sub-weapons and accessories. Another reason to complete the main storyline is it's required in order to obtain a Fairy, which provides a large variety of special buffs you can't obtain any other way, like instant resurrection without death penalty and auto-consumption of health potions. After you complete the quest, 'Paying Off Debts,’ to take money to Bobby Lauren in Heidel, you will have a window appear where you can select a Crossroad quest line of your choice. The window will not disappear until you make a selection of a Crossroad quest line. The Crossroad quest lines don't impact the main Black Spirit quest line rewards. So you will still get the same inventory slots, gear, etc, no matter which quest line you choose. You can choose and play through 1 among 3 dividing quest lines at Serendia. The quest you choose at Serendia will eventually join into one quest at Calpheon. Each dividing quest line has its own story, and each has its own path of Monster Zones to go through. ① The first path starts with the quest [Crossroad] The Lamenting Head of the League of Merchants. This path follows the same story as the pervious main quests. It follows Jordine and his ambitions to take revenge against Calpheon. ② The second path begins with the quest [Crossroad] Silence, We’re Done Here!. This path will lead you to NPCs around cities and towns that will ask you to help them with their big and small problems. Follow this path past the northern sections of Calpheon to arrive in Keplan. This is where you will start the quests covering the story about Oze, the daughter of the Lord of Keplan that has gone missing. ③ The third path starts with the quest [Crossroad] Each of Their Reasons. The story here will reveal the power struggles between aristocrats. You’ll be watching the story unfold by the side of the Xian Merchant Guild as they make their move into Calpheon. The Black Spirit quest, [To Level 50!] Breaking New Ground, must be completed in order to level up from Lv. 49 to Lv. 50. After you turn level 50, you can be killed by other players who have flagged for PVP. After completing the Black Spirit's Gift (Adventurer's Tome) quest, you will get an item with the effect "Prognyl Silver Bar Gain +20%." Prognyl Silver Bars are frequently obtained with beginner quests and can be exchanged at the Storage Keeper for 20,000 silver. For hoarders like myself, it will not take long for you to discover Black Desert Online storage can be a real issue. That is, unless your plan is to buy Pearls with real cash to increase Storage. When you are first starting out, it's not as bad. But expect to get much more loot after you hit level 51 and arrive in Mediah. Most Life Skills require lots of storage. You may want to choose one Life Skill to focus on. For example, you might want to store Cooking ingredients only and sell Alchemy ingredients to make more room. Cooking is much easier for a BDO Beginner to get started with. Most small towns and cities have a default storage of 16 slots each. This is where workers from that town or city will place goods they have gathered from Nodes. Storage is shared with all of your characters, enabling you to give gear and other items to alts. Alts: Turn your alternate character's inventories into storage. Loyalty Storage: Storage can be purchased with 500 Loyalty. (Would take 5 days of staying logged in for one hour each day.) Loyalty Storage gives 1 Extra slot for 2 city storages, in one territory. The Serendia Storage includes 1 extra Storage Space for Heidel and Glish. Calpheon is the only one that offers 3 cities instead of 2. Make sure you always leave one empty space in the city Storage, or your workers will get severely confused and not work anymore until you free up a space. This occurs even if they are harvesting something that is already stacked inside that city's storage. Poor workers! :( To me, this seems like more of a game bug. Similar weird things can happen when your character has a full inventory. So, if you are getting weird errors, when trying to hire a worker, for example, always check to see if your inventory is full! They like to sit in your pockets? LOL! Funny, but true. You begin with 24 Inventory slots, but you can raise that by 34 with quests for a total of 58 slots. To increase your inventory beyond 58, you will have to purchase inventory with Rookie Attendance Rewards, Loyalties, or Pearls. You receive 100 Loyalties each day you log in, allowing you to buy 1 inventory slot every 10 days. Or you can buy 8 slots for 800 Pearls ($8 or 16 slots for $14.50). 8 slots via Loyalties will cost you 2.6 months of waiting. Maximum inventory is 192 per character, so you can purchase up to 136 inventory slots for each character. The most recent "Rookie" Attendance Reward gives you 6 slots. (This could change at any time.) Normally, Attendance Rewards don't give Inventory increases. "Rookie" is only available to new players, once per account. Note: The inventory quests below will not increase your inventory if you have already purchased the maximum inventory slots of 192. Obtained via Black Spirit main story. Press O key then Main tab. Crio and Sandfish 20 Crio Velia (docks) Bag space +2 Have Fishing Quests turned on! Pre-requisite quest: Basic Fishing - A Fishing Rod. Make sure you don't have "Throw away useless items" checked. (Veil > Wine > Glass). Noble doesn't appear at night! - I Want to Be Like Father! 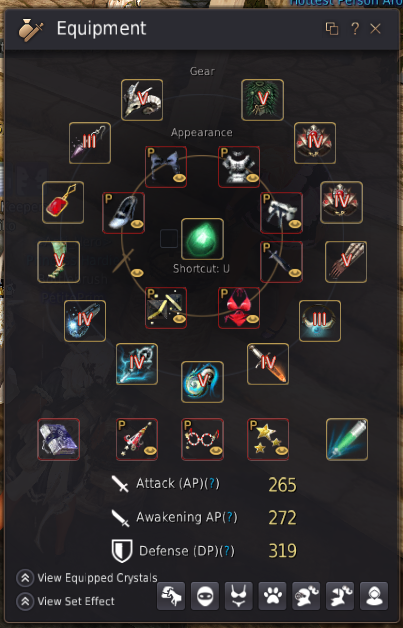 Many item names and icon borders in BDO are color coded to help you determine how rare something is. Workers, Life Skill levels, and items are all colored by grade/rarity. (They have a colored name/title.) Lowest is gray. Gray items are considered trash for the most part and most can be sold at the vendor. Some items can be exchanged for more than vendor price, if you have a large quantity of them and exchange them to a certain NPC that wants them. This type of exchangable loot has been removed from the majority of beginner grinding areas, but keep a watchful eye in later levels. Right click the exchangable item to draw a path to the closest exchange NPC. Some items like Memory Fragments are colored wrongly, so be sure to ask before discarding items you're unfamiliar with. BDO is a gear powered game and with the right gear, you can defeat enemies much higher level than you. Armor, weapons, and accessories can be enhanced to increase Defense Points (DP), Attack Points (AP), and many other stats. There are no level restrictions to enhanced gear. Even a level 1 character can wear the best PEN (V) gear. Weapons and Sub-weapons (aka Secondary Weapons) are class specific. Some weapons can be shared with more than one class. The main-hand weapon of Staff, for example, is used by Witches and Wizards. The sub-weapon Steel Dagger is shared between Witch, Wizard, and Ranger. Awakening weapons can only be equipped by characters level 56+ who have completed their class specific Awakened quest line. (Archer is the exception to this rule and he is limited to the beginner Archer Awakening Weapon until level 56.) Awakening weapons cannot be shared with a different class. For a more detailed guide on BDO Gear, please visit our Gear Progression Guide. For details on the best leveling spots, Combat EXP buffs, and more, please visit our BDO Leveling Guide. There is no level cap in BDO. However, there is what people call a "soft cap", where it gets to be nearly impossible to obtain a certain level. You see this reflected in the image I obtained of one of graphs available on Smite Datamining, which shows the amount of xp needed per level. As you can see, the xp needed for level 63 is much more than the amount needed for level 56. Getting to level 56 is fairly quick, but after level 62, leveling gets extremely difficult. Attendance and Event rewards can help offset the costs of upgrading or purchasing armor and weapons. There was a recent change to the beginner zones so that less junk and even green grade loot does not drop. Instead, Beginners should expect higher Black Stone drop rates than previously and higher value junk loot that they can sell at a vendor NPC. This should save you from having to buy pets immediately, but you will still need them for loot pickup after entering Mediah at around level 52. Don't sell any items that are used in weapon/armor enhancement: Ex. Black Stones, Shards. If you see something on the Central Market that sells frequently and there are zero to few available for sale, it's a good indication to hang on to it. Central Market was added in a Patch on 20th February 2019. The Patch Notes stated: "Central Market is the first step to create a free market economy where you as the adventurer create your own market without much restriction." It is more free than it used to be, but there are still Developer Min and Max caps, that can be difficult to determine unless you know what to look for. If you would like to know more about Central Market, please visit our Central Market Guide. The <Fish Vendor> Crio, sells fishing rods with 30 durability for 500 silver each. Better fishing rods can be crafted and sold on Central Market, but it will be hard for new players to get them. Many fishing rods have a skill level requirement. Read the fine print! Like many things in BDO, fish have different quality levels. White is the lowest quality and worth the least amount, followed by green, then blue, and lastly gold. Fresh fish steadily decreases in value the older it gets. After 24 hours, your fish will be useless. If your fish is almost expired and worthless, dry it. Open the processing window (L key) and select the fish icon that represents the drying process. Insert fish, dry, and you'll have your fish forever. Dried fish can be sold at the Marketplace and used in cooking. One fresh fish = 2 dried fish in recipes. West of Veila, along the beach, you will find a small group of players fishing all together. This fishing spot is well known for catching higher quality fish (gold and blue grade fish). Karon, the <Imperial Fishing Delivery> NPC on the dock in front of the <Storage Keeper> in Veila, will buy blue and gold quality fish at 250% of their base value, but he only buys a certain number of each type of fish during a set period. After his fish quota is filled, he will no longer buy your fish. Always try to sell your fish to him first, then sell what is left over to the <Trade Manager> Bahar. Use the NPC finder to locate him. Selling raw produce from nodes and hand gathering can net you a good amount, but processed materials are inherently worth more. (Most of the time.) Study the Central Market under the Materials tab and discover what products sell the most and the price they sell for. Items in BDO have a hidden price range determined by the game developers, unless you know what to look for. Player supply and demand also makes pricing fluctuate. Each item has a base price visible on the item. Central Market allows you to order/buy/sell at 10% above or below this base price. Some crafted items like Beer, a worker Stamina regeneration food, and Good Pet Feed will be in high demand. They have always been profitable, but that could change. You can also find items in which too many crafters have flooded Central Market and the price has dropped. Keep in mind that many items are not profitable to make! You can actually loose money crafting vs selling the raw goods after processing them. And even processing raw goods can make you loose money. Do your research before getting into any Life Skill. Many aren't meant for beginners to persue. After you reach level 30, you will be able to talk to Rulupee (Southern Heidel Inn), who will give you a series of quests. Each of her quest series has a goodie bag at the end, which is very nice. For more details, view our Rulupee Travel Guide. Here is the end reward bag for the first two quest series. This daypack contains items handy for first time adventurers. You will often hear players say that grinding is the best money per hour. Keep in mind that silver per hour is heavily dependent upon how fast your pets can pick up loot. For beginners, they made the loot system very simplified, where hardly any loot drops like it used to, but expect much more loot drops after reaching Mediah at around level 51. Inventory and weight does limit loot pickup, although less so for beginners because of recent changes to beginner hunting zone drops. You will probably start making good money from grinding by fighting Saunils around level 36. For super fast money, you can always sell a limited number of Pearl Shop items (like Outfits, Value Packs, and Pets) at the Central Market. Double check in the lower left window of the Pearl item you are considering. Hover over their icons on the bottom to make sure they have a Price. If they don't have a Price, they can't be sold on the Central Market and will be bound to you once purchased. You can register 5 to 35 Pearl items each week for sale, depending upon your Family Fame. Family Fame is a sort of measure of your account's growth, factoring in all of your Family achievements for Combat, Life Skills, Questing, and Knowledge. Default Pearl item registration limit is 5. The limitations for the additional amount you can register change according to Family Fame. Characters of level 49 and under are safe from PVP, but player versus player combat can't be avoided at level 50 and beyond (You can run, but you can't hide.) After you complete the quest that lets you move past level 49, another player can "flag up" and attack you at any time, except in safe areas like cities and towns. Unwanted PVP occurs most often because of hunting territory squabbles. If you don't like PVP, stay away from other player's "rotations" for popular grind spots. You will still get occasionally PVP'd while grinding, when someone wants to take your leveling spot, but it's not an every day occurance. Switch channels when grind spots are full. PVP flagged characters have glowing red names above their heads. Some players just enjoy playing the bad guy and killing others for sport. These players may even enjoy having negative Karma (aka red Karma). Negative Karma occurs when you "flag up" and keep killing players that aren't flagged for PVP (that don't have a red name) and your Karma points sink below 0. PvE Death (you have negative Karma) Guaranteed exp/crystal loss + chance to lose 1 gear Enhancment level. PVP Death in Desert (you have negative Karma): Jail time only: sentenced according to Karma (30/50/60 minutes) Desert area is in Valencia whenever you can't view yourself on the World Map. You will see a desert icon on your minimap. Negative Karma players will be attacked by NPCs, except in the criminal's town inside Valencia. Having extremely negative Karma can even destory the gear you are wearing upon death. PVP penalties do not apply during node war, RBF (Red Battlefield), guild war declarations, duels, or arena. PVE Penalties don't apply for boss deaths. Arsha is a special PVP server that removes any Karma penalties, and also increases loot drops for level 50+ players. Joining a guild has tangible benefits besides socializing and group activities. Guilds can earn points though guild quests and player advancement that they can spend on passive buffs to stats like Gathering, Fishing, and AP. There is also a daily contract payout amount that starts low and increases with time. At one time, joining a medium or larger guild gave an extra daily attendance reward. This may happen again in the future. NOTE: Guild pay outs coupled with active sea monster hunting was recently nerfed, but is still a popular way to earn silver for guilds that work together in vanquishing the terrors of the sea! Pressing your P key will bring up a window with your character's information, including a list of Professions (Life Skills) within a tab window. There are 7 ranks for each Life Skill and 10 levels in each rank. Master has 30 levels and the highest rank of Guru has 20 levels. Vist our Life Skill Levels guide for a more detailed guide on Life Skill Levels and the Life Fame benefit. Trading - active or semi-AFK trading by buying or making trade goods and delivering them far away. Gathering is a profitable activity that lets you gather all kinds of crafting materials used in other Life Skills and worker workshops. In many quest lines, it's a requirement that opens up other Life Skill quests. Each gatherable resource requires it's own tool to gather. Buy gathering tools at a <Material Vendor> or on the Marketplace. Or purchase a Tool Workshop and have your worker craft them for you. All gathering methods have a chance to proc the very valuable Hard and Sharp Black Crystal Shards which are used in enhancing gear. Lucky and Magic Tools increase luck while gathering. There is debate on how much, if any, Luck plays in gathering Shards. If you would like to increase your Life Skills, I recommend leveling up your Gathering Skill to at least Beginner 7 ASAP. This is easily done via Empty Bottle gathering at the fountain in Heidel. Purchase 34 Empty Bottles at the Material Vendor near the fountain. Or you can use any river/lake for gathering water. I like Heidel because the Material Vendor is only a couple steps away from the water source. Speedy Tip: Get to Apprentice 4 Gathering Skill to bypass 9 prerequisite Processing advancement quests. You may want to do them anyway, though, since they give you a free fence and other goodies. Gathering level Apprentice 4 is a little more challenging to obtain. You will need about 274 Empty Bottles filled. If you do skip the prerequisite quest chain for processing, then you will miss out on the Shabby Fence and some housing furniture, as well as additional Gathering/Processing XP. Press L to open the processing window. No tools are needed to process materials. Processed materials are inherently worth more than raw materials at the Marketplace (but this does not always mean they will sell well, if at all, on the Marketplace. Look at supply and demand before processing anything!). Processing, like fishing, is usually a good AFK way to generate extra income, after it is leveled up to Artisan level. (Always check Marketplace demand.) There is a questline to complete before you can process at higher levels. See our guide for the Beginner Processing Knowledge Questline. In BDO, the Processing Skill allows you to chop, heat, dry, filter, shake, and grind resources into processed materials. These refined items are often used in higher level crafting recipes. Everyone is able to do basic T1 processing. However, if you would like to do the second level of processing, (to create plywoods, ingots, cloth, etc. ), BDO requires you to obtain "Beginner" Processing Knowledge. There are up to three tiers of processing: T2 Beginner, T3 Skilled. Cooking is one of the first Lifeskills you will most likely level early on as you need to make Beer to feed your workers. Check out this Beer making guide, which also goes into greater detail on how to begin cooking. Cooking requires a Cooking Utensil installed in your residence. Purchase a Cooking Utensil from chefs or innkeepers. Utensils can sometimes be sniped on the Marketplace, or have your worker craft one in a Tool Workshop. Taming wild horses and riding your mount increases Training skill. You need ropes from a Stable Keeper to capture a horse in the wild. Read a more detailed guide about training in our Training Guide. When I first started BDO, AFK fishing over night was the easiest way to earn money and it probably still is. To AFK fish, press Space Bar, and let it go. You will automatically loot the fish after 3 minutes. Catching rare fish levels your fishing skill faster. With better fishing skill, you can use better fishing rods. Active fishing takes more keyboard warrior skill. To actively fish, approach water, equip a fishing rod, and press Space Bar to begin fishing. After you get a bite, press Space Bar to reel it in. You must successfully complete 2 mini-games to loot the fish. If you fail either one, the fish gets away. Read more about fishing in our Fishing guide. You need a matchlock to hunt. To level your hunting skill, you need to butcher <Wild> animals with a butcher knife or do hunting quests. To get started with Hunting, you should know about the Hunting quest line detailed in this Hunting guide. You need a fence and seeds to begin Farming. Pruning, killing pests, breeding, and harvesting crops increases Farming Skill. Farming is another profession you can do as a beginner that will help you get grain for making worker food. There is a low level quest line which will give you a free fence, or you can spend 3 CP on a Small Fence. Seeds can be acquired through gathering vegetation, the Marketplace, and seed vendors. A Withered Seed, sold by vendors, is the lowest quality seed, which will not yield very good results. But the good news is that you can breed them and there is a chance to obtain better seeds, which produce better crops. The next tier after Withered Wheat is the normal white grade Wheat Seed, which after about 5 hours from planting, will yield an average of 70 wheat. To find all the NPCs that will rent you a Fence, please visit our Fence Types & Locations Guide. Trading is the act of obtaining one Trade Good and selling it to a <Trade Manager>, (for, hopefully, a profit). Trading is often touted as a profitable profession in the game, but you can actually loose money doing it, if you're not careful. Before getting into trade, be sure to read up on it. It is not usually recommended for beginners. Alchemy creates potions (most have a shorter buff than foods), magic crystals, and reagents for Skilled Processing (Plywood Hardener, Metal Solvent, Gem Polisher). Alchemy requires an Alchemy tool installed in your residence. Purchase an Alchemy tool from a General Vendor, or on the Markeplace, or have your worker craft one in a Tool Workshop. Alchemy isn't as easy to get started with as Cooking. All Alchemy recipes require rare materials that you have to gather yourself or rarely obtain through nodes. This profession will take lots of time to level up, but help boost your character's power in many ways. The image below shows the default Hotkeys or Keyboard Shortcuts for different commands in BDO. The one you will use the most will be the Escape key. Through this, you can pretty much do anything you want, including accessing a helpful crafting knowledge database (F2) with recipes and item drop locations. One very handy tool in the Escape Menu is the Central Market button. You can make purchases away from town, as long as you have Silver in your Warehouse. bddatabase.net and bdocodex.com - almost identical websites, databases for everything Black Desert Online. Huge help to me! blackdesertfoundry.com - beautiful Black Desert Online guides. News and lots of great content. dulfy.net - lots of good guides. somethinglovely.net - my goto BDO Map site when I get lost, used to look up not only nodes, but crate (trading) calculations and horse breeding calculations. Also has leveling/hunting zones with recommended AP/DP. Lots of goodies here! invenglobal.com - helpful guides here. One benefit of this site is that they often have insight into what's currently happening on Korean servers, which undergo patches before we do. bdoplanner.com - BDOPlanner: awesome gear calculator. Plan and share gear builds. urzasarchives.com - guides on World Bosses and spawn info. Lifeskill Chat - for all Professions/Life Skills. BDO Horse Community - horse breeding, training, T9 horses, and racing. Sailing Dailies - Sailing dailies and Vell parties. BDO Traders - Trading, resets, and leveling discussion for the trade lifeskill. MaoMaoPrince Fishing Community - helpful fishing chat. BDO JP International Community - English-speaking community for BDO Japan.